The following blog was written by Dr. Daniel Galat, an orthopaedic surgeon who is the SIGN program manager at Tenwek Hospital in Bomet, Kenya. He received his orthopaedic training at the Mayo Clinic. He and his wife and 4 children have been living in Tenwek since 2008 and received training in the SIGN technique from Dr. Zirkle when he and Jeanne Dillner traveled through East Africa in 2008. According to the Human Sciences Research Council, Africa has the highest road traffic injury and death rate in the world. 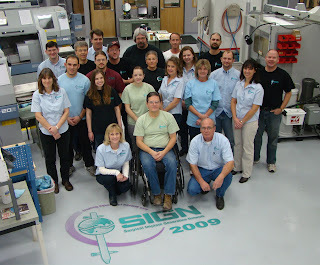 Tenwek Hospital became a SIGN program in 2008 and Dr. Galat attended the 2009 SIGN conference. Over the past few months, we have noticed a huge increase in the orthopaedic trauma volume at Tenwek Hospital, and now our current census has over 35 patients scattered throughout the hospital (even on the eye ward), making morning rounds a bit of a challenge. I find myself asking questions like, “Where did the patient with the bilateral open tibia fractures go?” and wondering when we will ever catch up. Daily surgery is just an attempt to keep up with the load of cases that continue to pile in, praying that God helps us do our best with each patient that He sovereignly brings to Tenwek. Currently there are 14 patients in the queue needing surgery. All around Tenwek and the nearby village of Bomet, are what seems like hundreds of new motorcycles, all the same brand, all the same maroon color. To help distinguish one from another, drivers cover the gas tanks with decals that vary from “the mother Mary,” to a “skull and crossbones” (very apropos). The cost of a brand new Bajaj Boxer 5 motorcycle (hot off the production line in India) is a cool 85,000 Kenyan shillings (about $1,100 USD). “How can so many people afford a brand new motorcycle (more than two years average salary in this part of Kenya), and where are they all coming from?” I wondered to myself. What was clear, however, was the fact that the increase in trauma is most definitely related to an increase in motorcycle accidents. A flurry of questions went through my head, as well as a sense of anger and injustice for all the passengers who have gotten injured or killed as a result of untrained, uneducated, and often irresponsible motorcycle taxi drivers who can rent a motorcycle for almost nothing and, in a millisecond, change their lives or their passengers’ lives forever. “Who then is the real entrepreneurial kingpin behind this phenomenon?” “Where are the regulations?” “Is this really true or is this just one person’s story?” Just today, we cared for a 14-year-old boy who was struck from behind by a motorcycle while walking down the road, with open femur and tibia fractures. His life will never be the same. Trauma in developing countries is becoming a worldwide health care crisis, on par, or now, even more important than AIDS or tuberculosis. When a young man or women trying to earn a living for their families gets a life-altering injury, the entire family can be thrown into poverty and chaos. We see it every day at Tenwek. Please pray that God would intervene to bring this important issue to the forefront of our leaders, that the subject would get due attention and that real change would be implemented. The new SIGN blog site, www.signblog.org will host content pertaining to all of SIGN’s work, rather than specifically to a hospital or a country. That said, there will be many posts here that come directly from our SIGN surgeons around the world as well as from our headquarters in Richland, WA. Please share this site with your friends and those who are interested in SIGN’s humanitarian aid work. Greetings from the entire SIGN staff! !